The geography of the place is obviously marked by the vast Sainte Croiw Lake, overlooked by the village. The village was located in the plain before moving on the mountain in the XVIth century. It?? ?s now at the edge of the Sainte Croix Lake, because the old site was drown. The entrance of the Baudinard Gorge is located in the town. Sainte Croix du Verdon will remind you of the Mediterranean villages, because of its beach an sun aspect. Whereas Baudinard doesn?? ?t have a lot of beaches, Sainte Croix has a large beach and a lot of nooks and coves for your favorite activity : getting a tan. Not far from Riez, and that?? 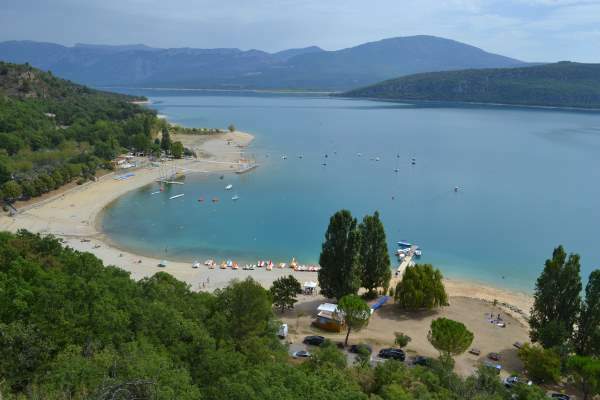 ?s convenient, Sainte Croix du Verdon is easy to reach from people coming from the A7 highway. Of course, you will easily find campsites to stay, to spend your vacation at the waterfront. The beaches are not the only interest, because the village is really well located. You will enjoy its location to visit Moustiers Sainte Marie and many other places. - Sainte Croix Lake waterfront - The castle remains - The parish church What to know Like in Bauduen, avoid the beaches in summer because they?? ?re crowded. You will find more calm beaches around.